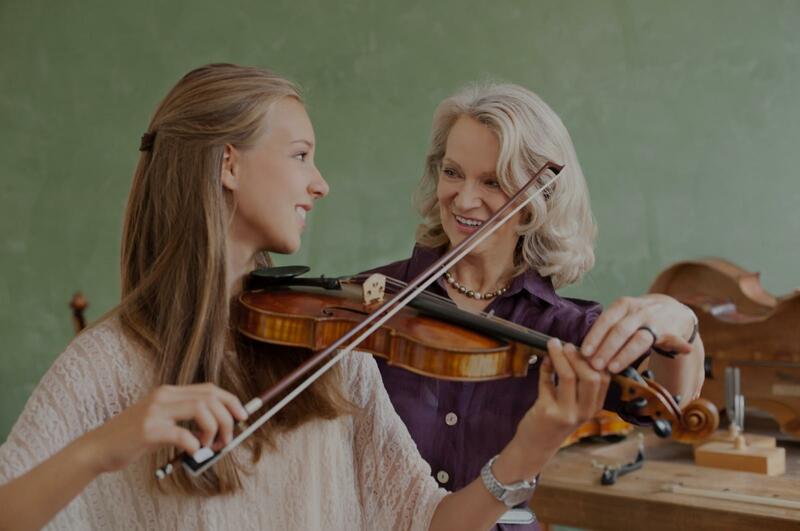 Haltom City, TX Violin Lessons Near Me | Fun Classes. Top Tutors. I've been teaching violin and string instruments for 10 years and my students have gone on to perform at everything from small recitals to with GDYO to as a member of TMEA All-State Orchestra. Within the first few lessons, you'll be able to hold the instrument properly and play 1-2 pieces rote (without reading music), and as time goes on you'll be able to read and write simple melodies that you can also play. I specialize in the Suzuki method, typically use Suzuki and Essential Elements books, and have the following tools available for your lessons: mirror, music stand, straws and other teaching tools. I love working with students of all ages and experience levels and I can't wait to meet you! I graduated December 2010 from Texas Tech University. I have my Bachelor of Music with a Teacher’s Certification in the area of strings and orchestral studies. My principle instrument is the violin and studied under Dr. John H. Gilbert as a part of my degree. I continued secondary piano studies with Dr. Carla D. Cash at Texas Tech University. At Texas Tech University, I worked two years as a teacher for the nationwide outreach program, String Project. With String Project, I would teach classes of 15 to 20 students at a time. These classes were forty-five minute violin classes held at the university twice a week. Each student had an additional thirty minute weekly, private lesson. My work, along with 4 other teachers, earned a position to lead two clinics at the annual ASTA convention, held in Atlanta Georgia in 2009. During the Spring 2011 semester, I spent my week in the Houston area as an orchestra teacher at Fort Settlement Middle School. During my time at Fort Settlement, I ran a program of 164 middle school string musicians on violin, viola, cello, bass and harp. The orchestra ranged from beginner to upper-intermediate levels. I had the opportunity to take 3 of the orchestras to UIL contest. All three groups came back with outstanding awards, including Sweepstakes, the highest award possible. I am a sought after violinist, pianist, accompanist, teacher, conductor, and adjudicator for several ensembles, musical organizations, and student recitals. I began my musical career at the age of eight playing the piano. I have continued to play and take piano lessons throughout my life. When I entered the sixth grade, at the age of 11, I began my violin studies. These violin and piano studies led to my eventual audition and acceptance at Texas Tech. Though one may think two is enough, I did not. After a year marching in the colorguard in high school, I began lessons on the clarinet at the age of 15 and joined the band. I continued to perform on the clarinet in the marching and concert bands throughout high school and college. With 6 years of private, group and public teaching, I am a state certified music teacher for early childhood through 12th grade. Since the fall of 2011, I also teach full time as a middle orchestra teacher in Lewisville ISD. I am a current member of TMEA, TODA, TMTA, and ASTA. I have taught a wide range of students and enjoy sharing my passion for music making. As a teacher, I want my students to understand and learn music in many different aspects. Understanding how to read notes and rhythms is important, but combining them with the emotion and sensitivity of music makes playing any instrument fantastic. Music theory and technique are other important aspects of playing all instruments and are stressed in each lesson as well. As students practice and develop their skill and understanding, it is my desire for students to express the music from the depths of their heart. I am generally a very easy to get along with, but I do have high expectations from my students. For beginners, I run my lessons in sections with stretches, detailed warm-ups, repertoire, theory and end with an overview of the lesson and expectations for the next lesson. With my intermediate and advanced students, I expect them to come in already warmed up and prepared. I will have them play through technique exercises with brief reviews and explanations for the next expected exercise. We then go immediately into repertoire where students will "perform" prepared pieces for me. I stop and work on things throughout and then set an expectation for the next lesson for repertoire before ending the lesson. *Note* I do expect all students to have an instrument to practice on. I highly encourage all beginners to RENT their first instrument from an instrument specialty store and not purchase one from a "department" or "super" store or online. Instrument specialty stores are always available to do repairs and upgrades with very decent prices. Purchased beginner instruments are hard to sell once grown out of. I do have names and numbers for multiple violin and piano shops in the DFW area, as well as a piano tuner. Students will need to provide all of their own equipment. I will bring any additional books on an as need basis. I will bring my own violin to violin lessons, but students will need to provide their own with accessories. we like this teacher. get to the point. Adrianna was able to teach at my six-year-old daughter's level of understanding. She was pleasant and clear and it looks like we're off to a great start! I can help beginning students on violln learn the basics. No matter which level I am teaching, I will incorporate my experience studying for more than 10 years at The Juilliard School at the lessons. Students of any level are welcome. Fast and accurate improvement will be shown with my method of teaching. I have been studying at The Juilliard School for more than ten years. I perform and also teach. During the lesson, I will use my successful method of teaching, which will show a quick and accurate improvement for the students. Naoko is a fantastic violin teacher. Patient, encouraging, skilled and knowledgeable. My 12-year old daughter can’t wait till her next lesson! I have taught violin for 10 years at various institutions including the University of North Texas and have performed around the world as a soloist and chamber musician. I am passionate about sharing music with students of all ages and skill levels and aim to bring out each person's full potential by imparting students with technical prowess as well as an understanding of the inner workings of music. My goal is to help students develop excellent intonation, tone, and rhythm as well as a lifelong passion for music. I also make sure to offer helpful practice tips to make practicing fruitful, efficient, and enjoyable! I hold a Master of Music from Arizona State University and am currently pursuing a Doctor of Musical Arts at the University of North Texas. Violinist Mia Detwiler has performed as a soloist and chamber musician in numerous venues throughout the U.S. and abroad. While comfortable and well-versed in traditional violin repertoire, Mia is an enthusiastic advocate for contemporary music. Her energetic performances of demanding new works offer 21st century audiences a sampling of music of their own time. Recent performance highlights include the consortium premiere of Robert Xavier Rodriguez’ Xochiquetzal Concerto for violin & percussion sextet as soloist with the University of North Texas Percussion Ensemble, a recreation of Philip Glass’ debut concert, and a recital at the 40th Foro Internacional de Musica Nueva in Mexico City. ring Trio and Duo Chromatica with whom she has premiered numerous works by Texas-based composers. She has also served as concertmaster of the University of North Texas Symphony Orchestra, the University of North Texas Festival Orchestra, the Unity Orchestra, and the Arizona State University Orchestra, and was a member of the Tallahassee Symphony Orchestra. Mia served as Violin Teaching Fellow at the University of North Texas where she maintained a studio of private violin students and coached chamber music ensembles. She has also taught for El Centro College, Tarleton State University, Arizona State University String Project, and the Tallahassee Youth Orchestra. She holds a Master of Music from Arizona State University and a Bachelor of Music from Florida State University. She is currently pursuing a Doctor of Musical Arts as a student of Felix Olschofka. I believe the key to becoming a successful musician begins with finding the joy in music. I teach a variation of the Suzuki Method which provides one of the best ways to grow into a strong violinist. My goal is for every lesson to be enjoyable and encouraging for each student. I have been playing the violin for 15 years and was tought by a Fort Worth Symphony Violinist. I love teaching and creating an environment that will help the students love to learn. My passion for music is why I want to continue to share that passion with others. I am a mom to a 10 year old boy and have been working in the Children’s Ministy at my church for 6 years, currently 3 years as the Special Needs Ministry Director. Emma is a proficient violinist with a real love for music. She is dependable and safe. She has a heart for children and is reliable. She is a wonderful mother and mentor to children as well. I highly recommend her! Emma has been teaching our daughter violin for over 2 years now. She is hands down the best teacher!! She is very knowledgeable, encouraging to our daughter and super easy to work with. We are amazed at how much our daughter has learned in these past two years with Emma! We are so grateful for Emma & the joy she’s brought into our home!!! nding a teacher who would be effective with a younger child. Ms. Nelson was the perfect fit. She selects music that is varied and interesting. She is flexible too. When my son showed an interest in learning Superman, she found the music and supported him. We love her patient, gentle, but firm approach. Ms. Nelson has high expectations and is very open-minded about what young students can learn. From the start, she incorporated teaching music notation & music theory at age-appropriate levels. She is extremely knowledgeable and shares her knowledge with students in an engaging and comprehensible manner. She instills a love of music in her students - what a gift! I can’t recommend Ms. Nelson’s music instruction enough. - Donovan Maes, age 8, La Mesa, CA"
"Cindy is wonderful! She does well working with children!" daughter already. My daughter looks forward to her lessons and loves learning something new each week. I don't know a ton about music or the violin specifically, but I can tell that Adrianna has a great system for teaching and my daughter loves her! I couldn't have asked for a better instructor!!" to be teaching someone her passsion. I'd definately recommend her." "Teacher seems to be a very good instructor, my daughter was very happy with the instruction." Dallas, TX teacher: Iva R.
Dallas, TX teacher: Dusty S.